Everyone needs a little bit of encouragement once in a while – it not only helps them get back on their feet after they have been knocked over, but it also puts a smile on their face. After all, even Superman would need a pat on the back from time to time, otherwise it would be better off if he were to leave us humans to our own destructive devices. If you feel that you need to step into a particularly explosive situation and save the day by being the diplomat, perhaps gearing up with the $14.99 Hero for a Day might be a good idea. 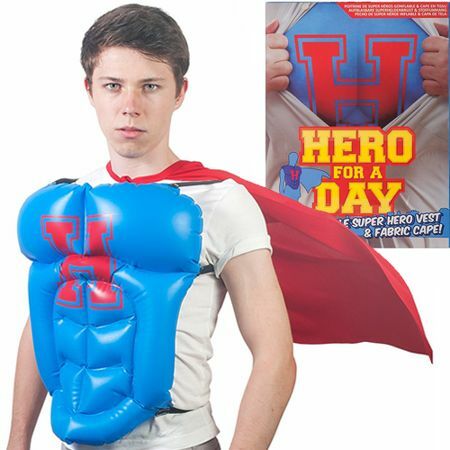 It gives the rest of the world a vision of what you would look like as a hero, where it comprises of an inflatable chest piece and cape. Don’t faint while blowing it up with your lungs now!